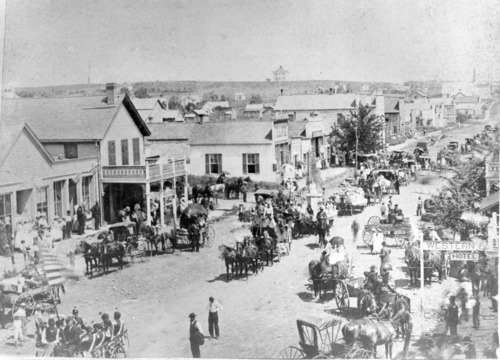 This photograph documents a parade on Missouri Street (the city's main street) of Alma, Kansas, taken approximately in 1885. The businesses in the photo are as follows (starting at the far left): E. Meyer's store; Kaufman building with a second story balcony; and the Bank of Wabaunsee County. Alma's first stone school house can be seen in the horizon on the hill near where the water tower is located today. As quickly as the wooden buildings began to spring up on Missouri Street, they began to burn, one by one, and soon, building codes required masonry structures with fire walls in the business district. By 1890, limestone had become the material of choice for building construction in Alma.